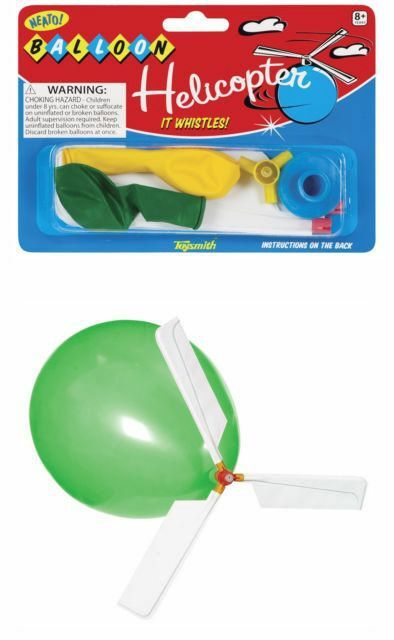 The Balloon Helicopter is easy to assemble. Inflate a balloon and attach the rotor blades to the opening. Let go of the balloon and watch the helicopter fly across the room. The Balloon Helicopter has a special valve that makes it whistle as it flies. Ages 8 and up. Warning: this product has small pieces not suitable for children under 3 years. Ordering information: The balloon helicopter includes 2 balloons, 3 rotor blades, 1 mouth piece, 1 blade assembly and assembly instructions.